For two weeks we didn’t have a working stove or oven. The oven started beeping one night. We turned off the circuit breaker and it stopped beeping. I used it the following night. But then the day following that it started beeping again. It beeped and displayed a code. The code indicated a part was broken. My husband concluded via internet research and taking the control panel off the appliance that he could order it and replace it himself. Part of the reason it took two weeks to get fixed was that there was a holiday and a weekend in there. The part being shipped was delayed because of the Holiday. By the time we got the part and he was able to put it in, it was the weekend. The part didn’t clear the error. Then there were issues in securing a repairman. For those of you that know how much I love my roasted vegetables you might understand having no oven was really difficult for me. Roasted veggies are not only yummy, but so easy to make. A few minutes prep then in the oven until they are done leaving you time to do other things. That is why I love my oven. During the two weeks we ate take out. We ordered Chinese Food, which for us equates to a few nights of Chinese Food. 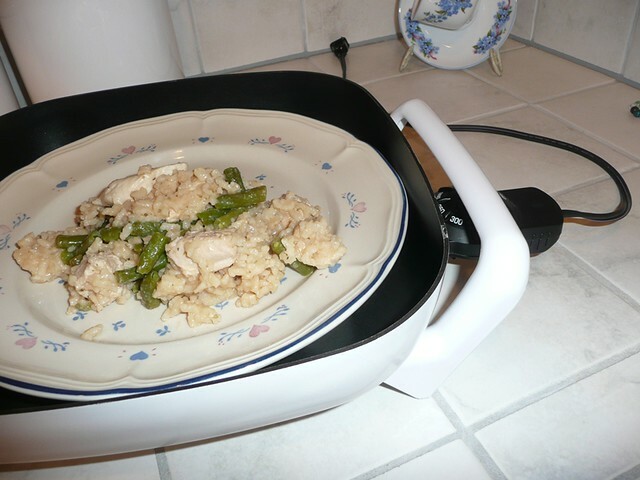 I also used my toaster oven, my electric skillet, my crock pot, and my Cuisinart Grill. So it was not as if I had no way to cook, it just put a cramp in my cooking a bit. On the nights I have a Nia class I like to put our dinner in the oven and have it turn on about the time that class is over. By the time I get home whatever is cooking is either done or on its way to being done. Without that I had to come home and start cooking. But alas I have a stove and oven again. YAY! I missed them. While I was not being able to use my stove and oven I tortured myself by looking at a cooking magazine. As soon as my stove was fixed I decided to try a new recipe. The recipe is from Bobby Deen. I got it out of the Food Network Magazine. 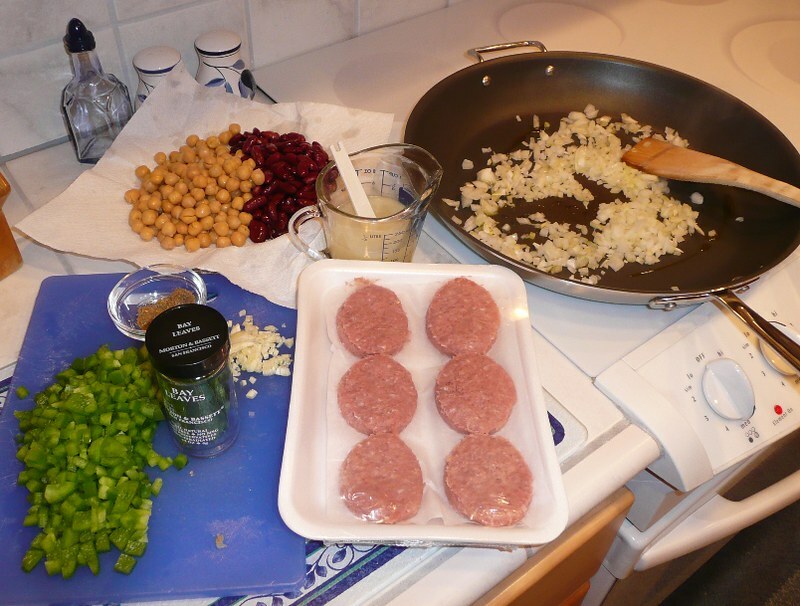 The name of the recipe is Monday-Night Red Beans and Rice and is on the Food Network website. 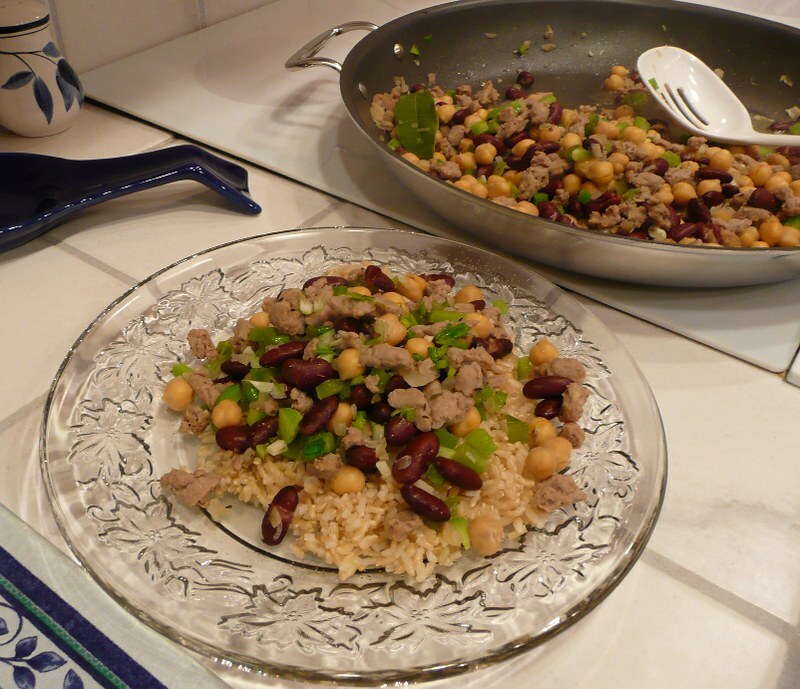 Not your typical Red Beans and Rice recipe. I made some adjustments, of course! I am posting it here as I did made it. I am calling it something different too! Cook the onion in the olive oil over medium-high heat. Add the sausage, chopping it up and separating it as it cooks. Stirring it and moving it around as necessary. Cook until almost cooked through. Add the garlic. Mix the garlic into the onions and meat. Cook for about 1 minute. Add the beans, chicken broth, cumin, thyme, bay leaf, green pepper, salt to taste, and pepper to taste. Stir the ingredients until it is all mixed well. Reduce heat and cover. Let cook about 10 minutes. Serve the mixture over rice. Top with the scallions. This was so good. I used my beloved 14 inch pan that I missed for two whole weeks. Once the beans were added my stirring was gentle as I didn’t want to end up with smashed beans, but I also wanted to make sure the spices were distributed and the bay leaf touched a lot of the ingredients. So I stirred a lot, but not vigorously. My typical spices consist of garlic and onions. I didn’t even have cumin. I had to buy it with the sausage and onion. Yeah, I was out of onion. I have a stock of kidney beans and garbanzo bean. I have them both for the bean salad I like. Plus I love to roast the garbanzos. I actually DID put pepper in this while I was cooking it. For those of you that know me (either in person or through my blog) you know I don’t like pepper/spicy hot, but the pepper my friend gave me (SMOKED PEPPER) I can handle a little bit of. So I put a little in the pan while I was cooking. When I served it to my husband I put a lot of pepper on his. While he was eating it he kept saying he was surprised I could eat it. He thought it was too hot for me. I had him taste mine . . . . which had NO extra pepper and he said the flavor was a little different. So maybe the pepper brings out a different flavor. Either way, we both loved it and I can see this becoming one of those meals I cook often. I can see experiments with different sausages and no meat at all. I can also see me cooking more with cumin. Do you like red kidney beans? Do you like garbanzo beans? Doesn’t this sound tasty?